I've mentioned more than once in my weekly link round-ups this summer that I know when it's over 110° here in Phoenix by paying attention to the birds. Just like humans, birds suffer from the heat the most when they're very young or very old, and I make sure that I have shade, food, and plenty of "watering holes" for them. 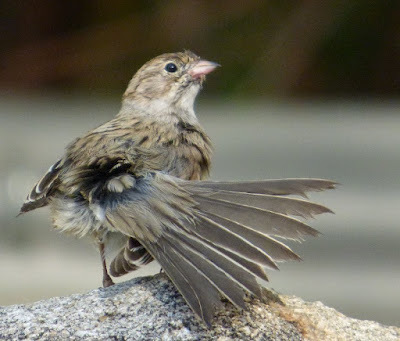 In the blazing desert summer sun, I have to fill those bird baths twice a day, but it's the least I can do for the feathered friends that give me so much pleasure every day. Here's an incomplete photographic record of some of the wilted visitors that came to Casa Kittling for a little shade and water. You can click on any of the photos to have it open automatically in a new window so you can see it full size. 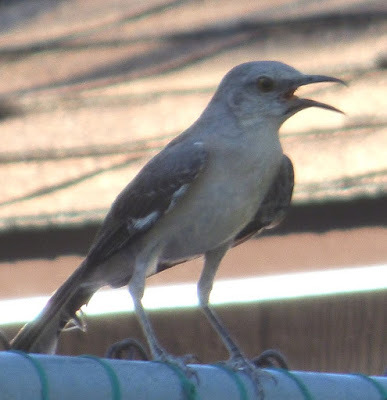 Some people don't like mockingbirds because when mating season arrives, they sing all night long. Being a night owl myself, I love listening to them. One year we even had one that could sing "La Cucaracha" due to an ice cream truck that played the song endlessly. You can tell the mockingbird in the photo is heat stressed because it's holding its wings away from its body and its beak is gaping open-- both signs that it's trying its best to cool off. Taken the same day as the mockingbird photo, this photo is of a European Collared Dove. It, too, is stressed from the heat, but it is a non-native species and isn't adapted to our weather. Notice how it doesn't have its beak open? Notice how it's right out in the blazing sun instead of in the shade somewhere? This summer has been extremely hard for these collared doves. I've found eight of their corpses in our garden-- and none from any other species of bird. I don't know how they got to the Sonoran Desert, but they really needed to stay home, poor things. 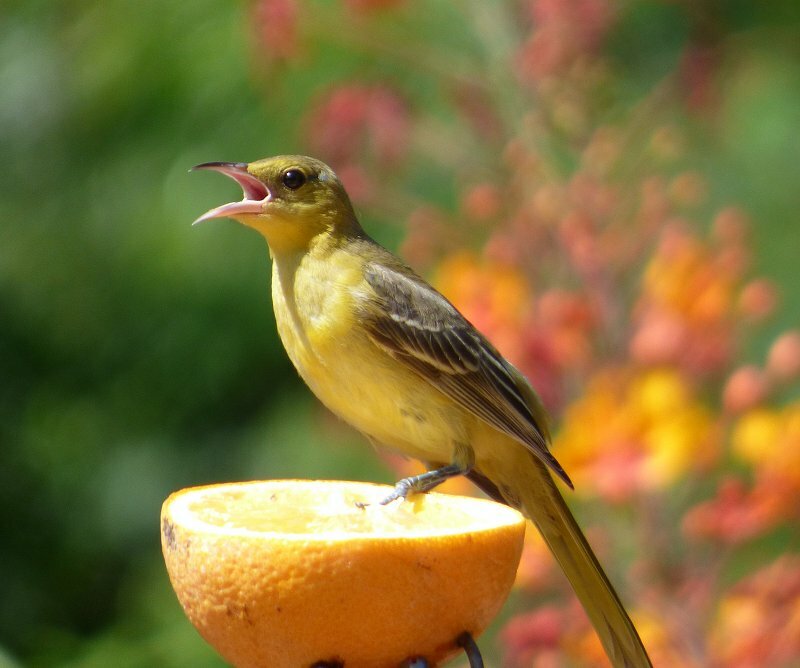 This young Hooded Oriole thought some tasty oranges might make it feel cooler, but after a few seconds, it decided hanging out in the shade on one of the hummingbird feeders was much smarter! 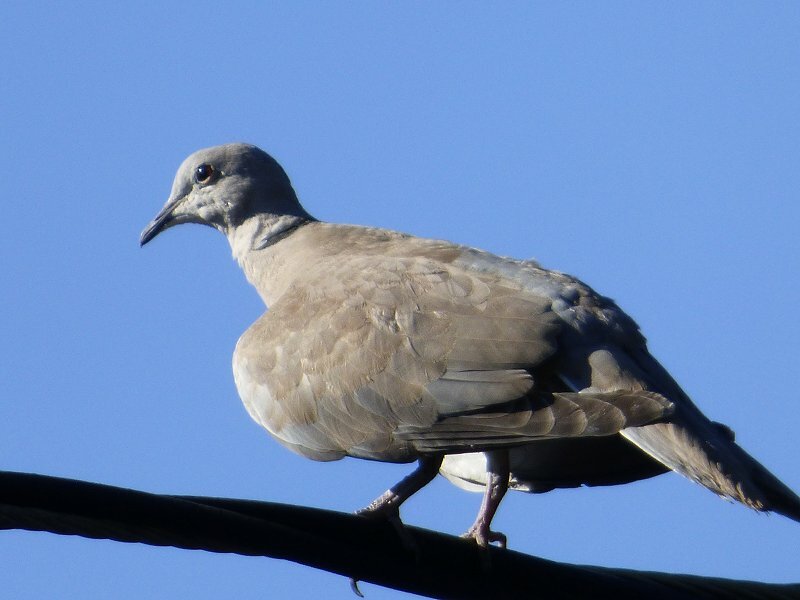 White-winged Doves and Abert's Towhees are native to the desert, and they know the importance of shade and water. The doves are two of the gang of juveniles that would keep trying to sit in the pool like I do. I bought them their own "kiddie pool," and they made a lot of use of it, as did other birds like the towhees. 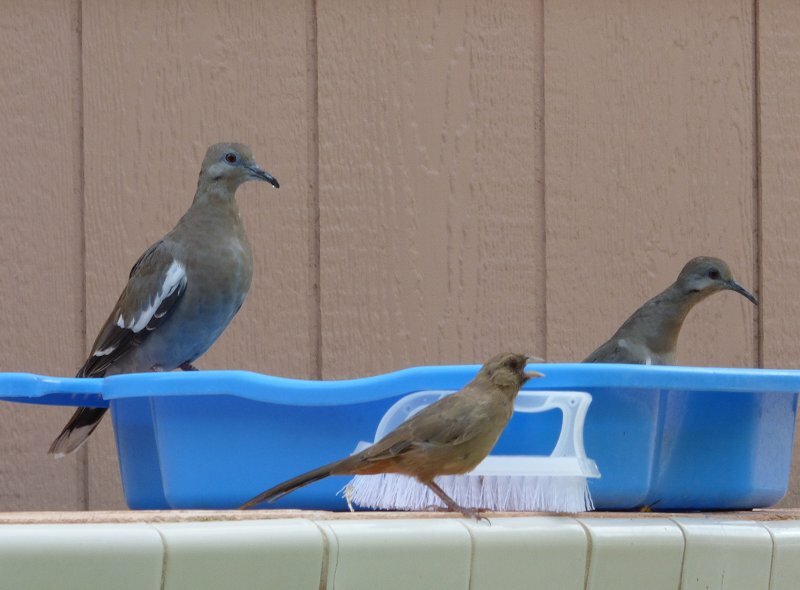 The towhee is a little stressed, but after kicking that scrub brush into the pool and chasing off the doves, it took an extended bath in the kiddie pool and felt much better! We also get summer migrants stopping here, like the Bell's Vireo above. I heard this shy little bird one day, but it wasn't until the next day that I saw it-- the waterfall a few feet away was just too tempting for it to ignore! 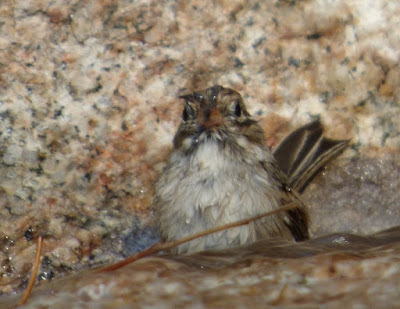 I wondered what was wrong with the photo until I saw it full size and realized that the bird has a water droplet on its head. It spent a lot of time playing in the water before it moved on to parts unknown. Now doesn't this poor youngster look hot and scruffy? The first time I ever realized that a hummingbird's beak actually opened like any other bird's was on a visit here to Arizona. 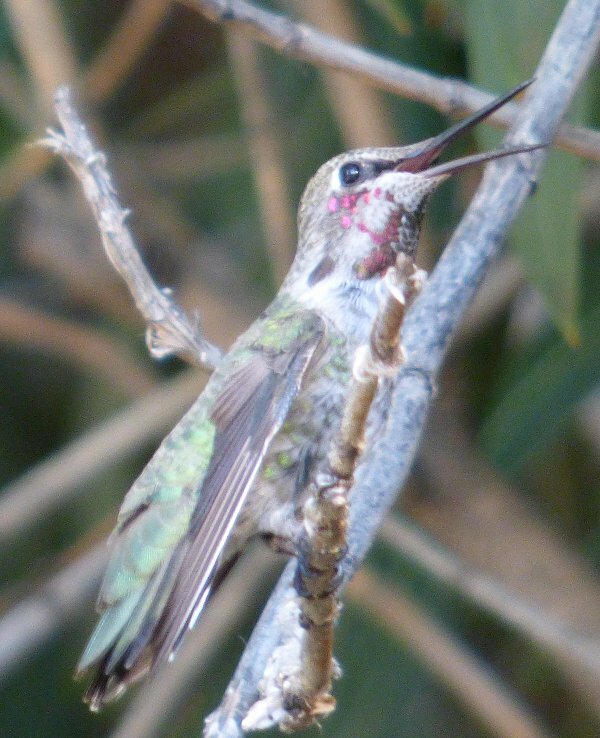 The little critters do make a lot of noise, but usually when you see them sitting in the shade with their beaks wide open, it means one thing: they are overheated. During the hottest parts of this summer, I had up to six hummingbirds fighting over the waterfall at the same time. Cooling off its tail feathers! I was never certain just what kind of bird this was, but it loved the waterfall with a passion. In fact, it just plopped down and sat in the water for over a minute. 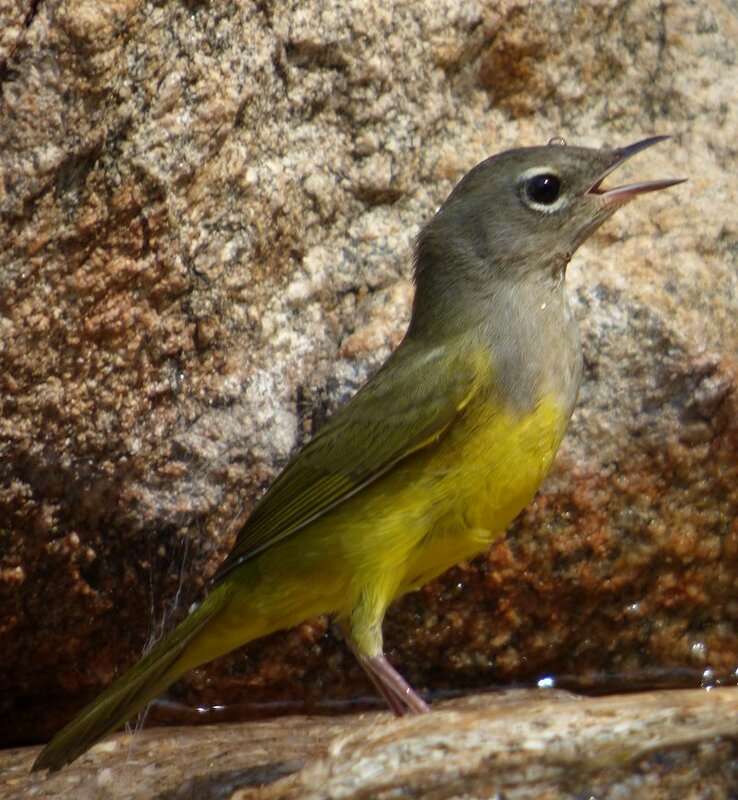 Native birds know what to do: (1) get out of the sun, and (2) find water. But even though they know what to do, they don't always make it. I try to make a difference. Oh, Cathy, these are gorgeous 'photos! I think we don't often remember that the heat is just as hard on birds and other critters as it is on us. We had a blast-furnace heat wave a couple of weeks ago, and coyotes were coming out of their usual haunts looking for cool and for water. And we've made it even harder for them because we've taken away so much of their habitat. I love seeing all of your bird photos - and hearing your stories about them! The one with the water drop on its head is my favorite. I wish we could do something similar here, but the mosquitoes would have a field day with all of the water. Of course, with all of the humidity and the local rivers, etc. the birds here don't seem to have a problem finding water; neither do the mosquitoes for that matter. Yes, I lived in that climate for the first part of my life. I loathe mosquitoes. Great photos and info, laughed about the mocking bird doing La Cucaracha. I like mocking birds. Great photos and stories about these poor, overheated birds. I think when we are feeling the heat, we don't always think about our fine feathered friends. I think you're right, Kathy. It's as though-- since they can fly-- most humans have given them other super powers, like never being hot or thirsty.